CD1025 is an “alternative” radio station here in Columbus. They are one of the few remaining radio stations that are independently owned and they take great pride in it. For data nerds like me, they also put a real time list of recently played songs on their website. The page has the most recent 50 songs played, but you can also click on “Older Tracks” to go back in time. When you do this, the URL ends “now-playing/?start=50”. If you got back again, it says “now-playing/?start=100”. Using this structure, I decided to see if I could download all of their historical data and see how far it goes back. In the code below, I use the XML package to go to the website and download the 50 songs and then increment the number by 50 to find the previous 50 songs. I am telling the code to keep doing this until I get to January 1, 2012. This takes a while and is fairly large. My file has over 150,000 songs. If you want just a little data, change the date to last week or so. The first thing I will do is parse the dates and times of the songs, order them, and look at the first few songs. You can see that data only goes back to March of 2012. Using the sqldf package, I can easily see what the most played artists and songs are from the data I scraped. I am a little surprised that Silversun Pickups are the number one band, but everyone on the list makes sense. 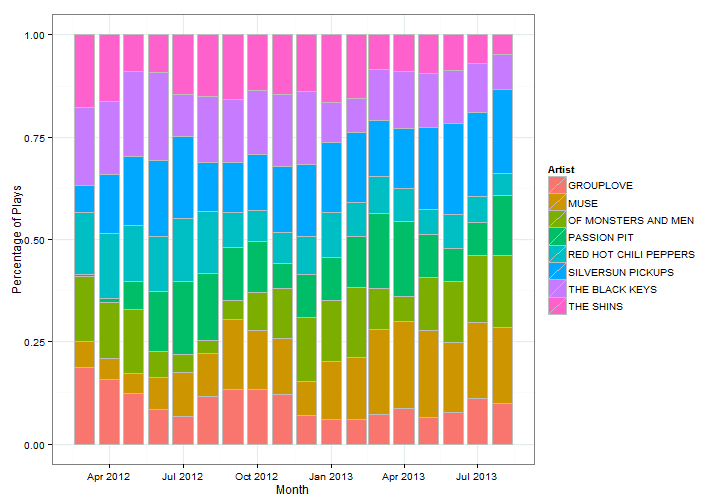 Looking at how the plays of the top artists have varied from month to month, you can see a few patterns. Muse has been more popular recently and The Shins and Grouplove have lost some steam. 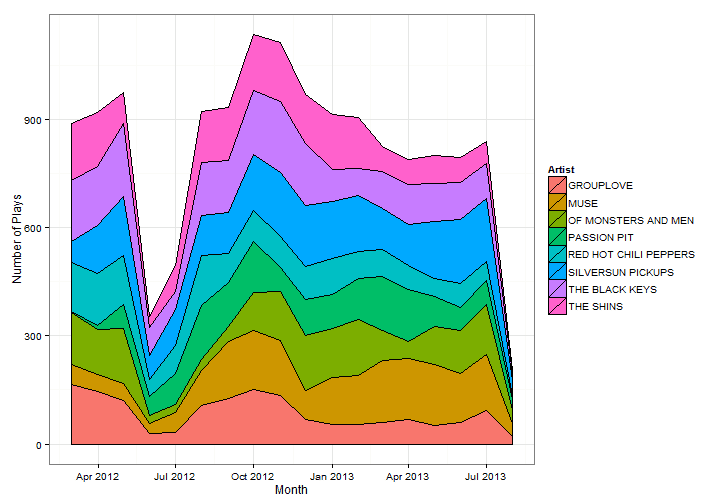 For the play count of the top artists, I see some odd numbers in June and July of 2012. The number of plays went way down. Looking into this further, I plotted the date and time that the song was played by the cumulative number of songs played since the beginning of the list. The plot should be a line with a constant slope, meaning that the plays per day are relatively constant. 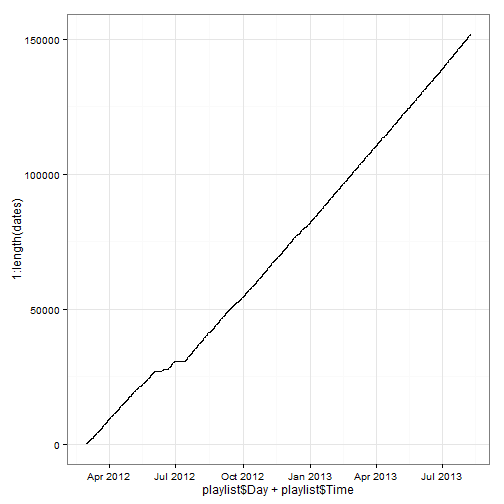 You can see in June and July of 2012 there are flat spots where there is no playlist history. There are also smaller flat spots in September and December, but I am going to decide that those are small enough not to affect any further analyses. From this, I am going to use data only from August 2012 to present. Next up, I am going to use this data to analyze the plays of artists from Summerfest, and try to infer if the play counts varied once they were added to the bill.